Students can join over 40 athletics teams at Greenwood - and over 80% of them do. Our dedicated coaches work with students to build skills and foster a love of the game. Athletics at Greenwood are infused with the spirit of learning and growth. Athletics are not only about competition (though Greenwood has garnered over 50 championship banners in its short history). It’s about what athletes learn from the experience of competing - being part of a team, stretching physical limits, maintaining focus and winning or losing gracefully. That feeling of teamwork carries over into the classroom, and prepares our students for their postsecondary lives. Greenwood teams have garnered over 50 championship banners in the school's short history. Open gym periods, offered at lunchtime daily, also give students an opportunity to get their blood moving and release stress. Greenwood is a member of the Conference of Independent Schools Athletic Association (CISAA) and competes with other schools of approximately the same size. Some teams compete up a division (with larger schools) to be eligible to qualify for Ontario Federation of School Athletic Associations (OFSAA) Championships. 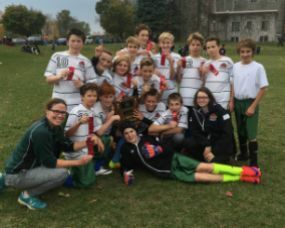 So far, we have had OFSAA qualifiers in boys’ volleyball, girls’ volleyball, girls' cross-country, co-ed skiing and co-ed snowboarding, as well as many individual athletes in swimming, tennis and track and field. As for our facilities, our second gym - completed in September 2016 - has doubled our capacity for indoor athletics. Nearby facilities including Leaside Arena, Deer Park Pool and Cherry Beach are also used to support our teams. Open gym periods, offered at lunchtime daily, also give students an opportunity to get their blood moving and release stress while engaging in the physical activity of their choice.